In the Fall of 1997, I went on a field trip to the Salton Sea, in Imperial County (California), accompanied by Messrs. Sudhir Kumar and Rajendra Pandey, staff scientists of the National Institute of Hydrology, Roorkee, India. At that time, Kumar and Pandey were on four-month assignments at San Diego State University, funded by the United Nations Development Programme. The Salton Sea is an artificial lake located in the Salton depression, well below mean sea level. The lake has been sustained since the 1930's by agricultural drainage from the Imperial and Coachella valleys. In the hope of learning more about the sea, we decided to inspect the entire shore and its environs. At the time, we were researching a paper about the restoration of the Salton Sea.1 Since the inland sea is fairly large (with a surface area of about 979 km2), we planned a two-day visit, which included camping at the Salton Sea State Recreation Area on its northeastern edge. As the night approached, we pitched our tent and settled down for a well deserved rest. Little did we suspect that, in the middle of the night, we were going to be awakened by a loud noise that first appeared quite distant, but kept getting louder. We soon realized that it was the sound of a train. As it got closer, the trembling of the earth below us and the crescendo of the noise combined to produce in us an erie feeling. There we were, in the middle of the desert, with darkness and frigid weather all around us, hopelessly pinned down inside a tent. We figured that there was nothing we could do; just wait until the train passed. My sense told me that we were safe; nevertheless, the experience was quite frightening. The next morning we confirmed our suspicion: we had pitched our tent too close to the tracks. Fortunately, we survived to tell the story. 1 Ponce, V. M., S. Kumar, and R. P. Pandey. 2000. "Restoration of the Salton Sea using solar still distillation." Revista de Estudos Ambientais, Blumenau, Brazil, v.2, n.2-3, 96-102. 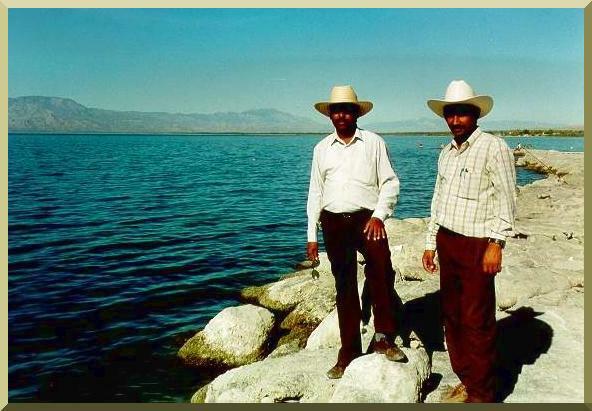 Messrs. Kumar and Pandey at the Salton Sea, California.